MooseLake’s Perpetual Bliss takes Best in Breed and a Group 4th under judge Martin Doherty. He also awarded her Best Puppy in Group. This was a winning weekend. At the Association Canine de la Maurice Show on June 27th, Judge Deborah Graffman awarded CH MooseLake’s Got a Hold on Me (aka Shania) with Best in Breed. She also awarded Mooselake’s Right On Time (Aka Gucci) with Best Puppy in Breed. At the Club du Labrador du Quebec, Judge Jean Louis Blais, awarded MooseLake’s No Trouble with Best Baby Puppy in Breed. CH MooseLake’s Last Dance took Best in Breed in the first show on Friday and on Sunday, she was awarded Select on the second show and on Saturday. Cora also had a good show, she took Best Baby Puppy in Breed on Saturday and Best Baby Puppy in Group on Sunday. awarded by Judge Edgar Bajona. On July 20th under judge David Swartwood she again took Best of Opposite. 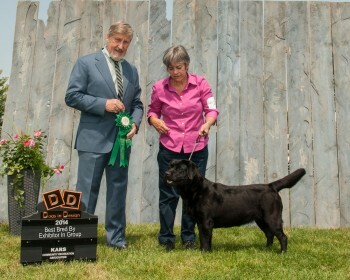 On July 19th, Bliss takes Best of Winners under breeder Judge Jean Louis Blais and attains her Canadian Championship! Congrats to Will and Rosanne. July 20th, under judge Bonnie Threlfall, Ch MooseLake’s Avalon CGN CDX RE WC, receives Best Veteran in Group! Congrats to Nora and Avalon. MooseLake’s Perpetual Bliss continues to do well in the Show Ring, June 19th & 20th she was Best Puppy in Group under breeder judges, Patricia and Mike Lanctot. 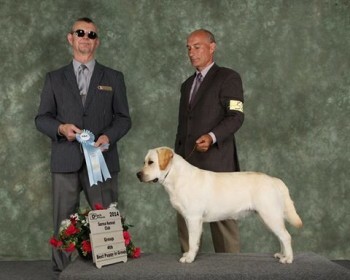 Then went on to win Best Puppy in Show under Patricia Lanctot, June 20th. At Champlain Dog Club in Petawawa, under Dr. Micheal Woods she got Best of Breed. She then went on to take a Group 3 under Mrs. Deborah Graffmann. On Saturday April 12th, under Judge Morley Thornton, he awarded Nike with a Group 2nd. We thank the Judges for recognizing this girl. BBPIS/BBPISS MooseLake’s Perpetual Bliss has another excellent show weekend. Shown by owner Will Starkman, under Judge Jocelyne Gagne gave Bliss Best of Breed! Then on Sunday under Judge Charles Trotter gave Bliss Best Puppy in Group. Bliss is 6 months plus 6 days! Very proud of this girl! Congratulations Will and Rosanne. Exciting news, MooseLake’s Perpetual Bliss (aka Bliss) owned and loved by Rosanne and Will Starkman, took her first Best Baby Puppy in Group under Judge Tomio Fujihata. On Saturday December 28th, at the South Western Ontario All Retriever Society, judge Tomio Fujihata, gave Bliss Best Baby Puppy in Specialty Show. On Sunday December 29, 2013, under Doug Windsor, received her second Best Baby Puppy in Show! Congratulations Will and Rosanne, Callibreeze Kennels. First time out, Sidney is awarded Best Bred by in Group under Judge James Reynolds. Sydney showed really well and we look forward to getting her out next Spring.